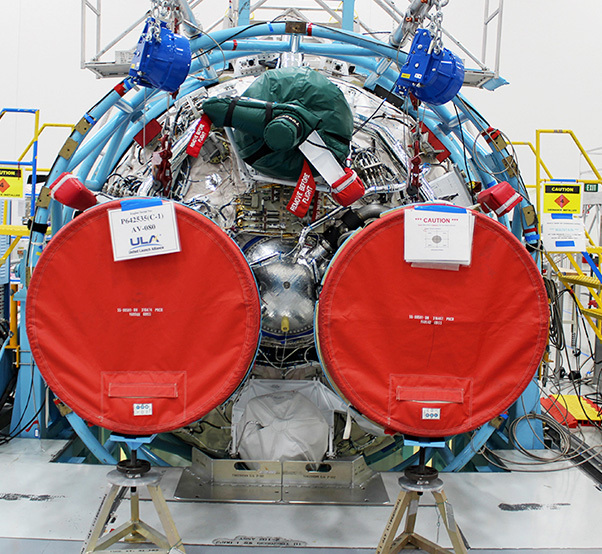 In the photograph on the left, the upper and lower domes of the Boeing CST-100 Starliner Spacecraft 2 Crew Flight Test Vehicle were mated June 19, 2018, inside the Commercial Crew and Cargo Processing Facility (C3PF) at NASA’s Kennedy Space Center. The Starliner will launch astronauts on a United Launch Alliance Atlas V rocket to the International Space Station as part of NASA’s Commercial Crew Program. On the right, the SpaceX Crew Dragon spacecraft that will be used for the company’s uncrewed flight test, known as Demonstration Mission 1, arrived to Cape Canaveral Air Force Station on July 10, 2018. The spacecraft recently underwent thermal vacuum and acoustic testing at NASA’s Plum Brook Station in Ohio. The Demonstration Mission 1 flight test is part of NASA’s Commercial Crew Transportation Capability contract. NASA and commercial industry partners Boeing and SpaceX are making significant advances in preparing to launch astronauts from U.S. soil for the first time since the space shuttle’s retirement in 2011. As part of the Commercial Crew Program’s public-private partnership, both companies are fine-tuning their designs, integrating hardware, and testing their crew spacecraft and rockets to prepare for test flights. Later in April, NASA trained Boeing and SpaceX teams to operate the Mine Resistant Ambush Protected armored vehicle designed to help personnel escape the launch pad in the unlikely event of an emergency on launch day. Astronauts and ground crews would have the option to shelter in place in the MRAP, or drive away from the launch pad. 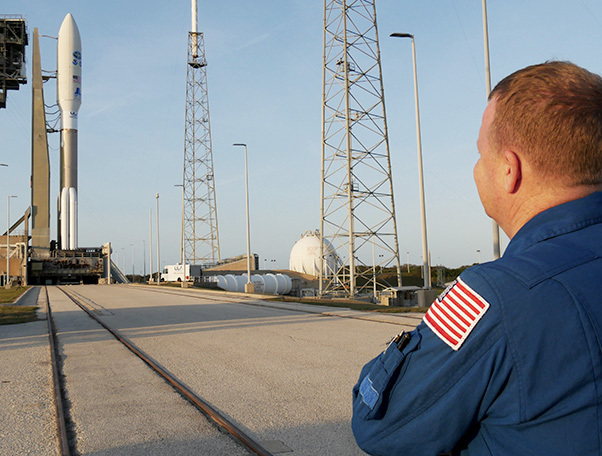 NASA astronaut Eric Boe, one of four astronauts working with the agency’s Commercial Crew Program, had the opportunity to check out the Crew Access Tower at Space Launch Complex 41 (SLC-41) with a United Launch Alliance Atlas V on the pad. Boe, along with launch operations engineers from NASA, Boeing, and ULA, climbed the launch pad tower to evaluate lighting and spotlights after dark. The survey helped ensure crew members will have acceptable visibility as they prepare to launch aboard Boeing’s Starliner spacecraft on the Crew Flight Test to the International Space Station. 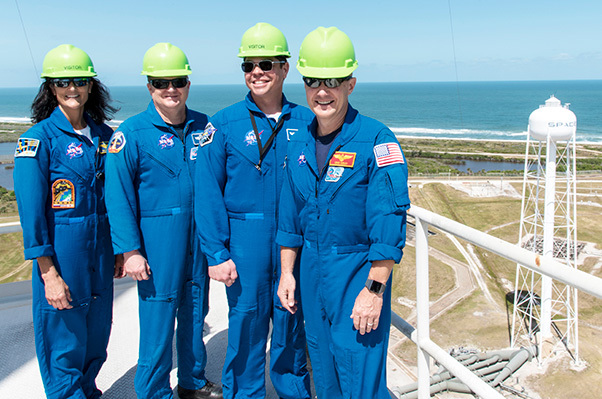 Commercial Crew Program astronauts, from the left, Suni Williams, Eric Boe, Bob Behnken and Doug Hurley take in the view from the top of Launch Complex 39A at NASA’s Kennedy Space Center. The astronauts toured the pad for an up-close look at modifications that are in work for the SpaceX Crew Dragon flight tests. Tower modifications included l removal of the space shuttle era rotating service structure. Future integration of the crew access arm will allow for safe crew entry for launch and exit from the spacecraft in the unlikely event a pad abort is required. 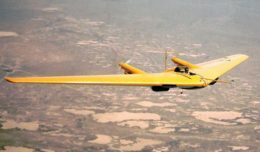 Also in April, SpaceX, NASA and the Department of Defense, conducted joint rescue and recovery exercises in the Atlantic Ocean off of Florida’s eastern coast. In this simulation, DOD pararescue specialists jumped from military aircraft, parachuted to the water, and simulated stabilizing the Crew Dragon capsule and safely removing astronauts from the spacecraft. The United Launch Alliance (ULA) Orbital Flight Test dual engine Centaur stage of the Atlas V rocket is in the final stage of production and checkout on May 22, 2018, at ULA’s factory in Decatur, Alabama. Boeing’s CST-100 Starliner will launch on its first uncrewed flight test on the ULA Atlas V rocket. 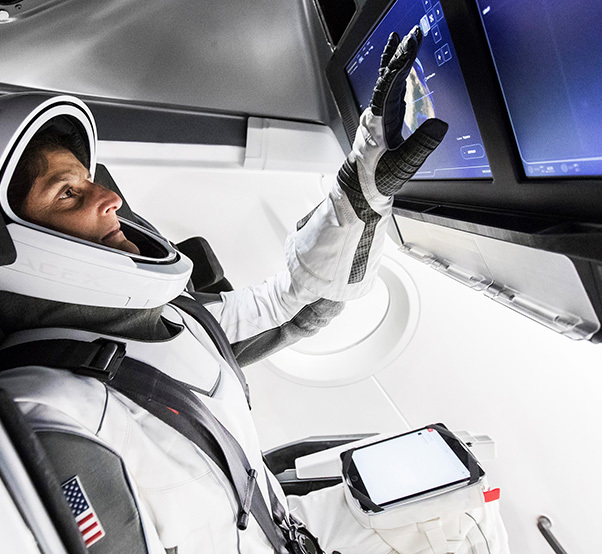 NASA Astronaut Suni Williams, fully suited in SpaceX’s spacesuit, interfaces with the display inside a mock-up of the Crew Dragon spacecraft in Hawthorne, Calif., during a testing exercise on April 3, 2018.